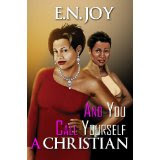 Unique is still a noticeable diva in, And You Call Yourself A Christian, book on in the new Still Divas series by E. N. Joy. Unique is trying to live on the straight and narrow but struggling is trying her patience. When Unique decides to confront one of her baby’s fathers for help she is unaware that she will become part of an unsuspected chain of events. Lorain is settling into being a new mother to her twin daughters. Lorain is also debating on pursuing her relationship with Nicholas. When she decides to give him an answer to his wedding proposal, Lorain finds out her eldest daughter is in jail and in major trouble. And if God was not testing Lorain further, she has to work with Unique’s adoptive mother to get Unique out of her current situation. Will Lorain make it through? And You Call Yourself A Christian is about family and having faith that anything can be accomplished through Jesus Christ. E. N. Joy does a wonderful job allowing readers into the dynamics of Unique and Lorain’s relationship. The main characters were well-developed, full of energy and shared their true emotions in this entertaining and suspenseful book. I believe And You Call Yourself A Christian was a great way to start the new series. I look forward to the next installment in the series. I definitely recommend this book to others.